For a full Sunday this October, at our store in Atlanta, Roy Underhill, Host of the long running PBS series The Woodwright's Shop , presents "The Dovetail Variations" – a day of dovetails, from the familiar to the vaguely disturbing! From half and full blind to the impossible miter­ended rising dovetail skirt joint (whew! 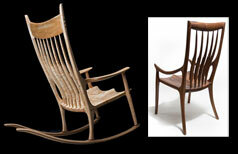 ), Roy will explore the keystone element of joinery in a range of surprising forms and functions. This month we are featuring the woodworking projects of Frank Zemberi, who is 70 years old and enjoys making Santa sleighs, reindeers, and grandfather clocks. This month we are featuring the carving projects of Blair Swing, who has carved a 12" replica of Marvin the Martian, which earned him an Honorable Mention at this year's Texas State Fair. This month Jim shares a tip on leaving shop reminder notes for yourself to keep track of your projects, as well as a money-saving tip on labeling your shop trash cans. Question: Can pure or polymerized tung oil be applied over an existing, fully cured oil finish? Once again, Lost Art Press has come out with an exceptional offering, this time a complete compilation of the plates that illustrate Roubo’s massive 18th century undertaking, L’Art du Menuisier . Translated, the title means the Art of the Cabinetmaker. The plates themselves display furniture, of course, but they go far beyond that in scope and include much more than what modern woodworkers would consider cabinetmaking. But beyond the contents themselves, this large volume is simply a pleasure to hold and a treasure to own. This month, Jeff reviews the Earlex Sprayport , which is the perfect compact finishing sprayer to have in your workshop, whether you are a small professional shop or a serious amateur woodworker. In his review, Jeff explains the different parts and features of this sprayer, and how they all come together to produce the perfect finish for your project. What do you get when you combine beautiful vintage hardwoods and contemporary lighting? You get the beautiful pieces made by Neil Murphy, who incorporates both form and function into his projects - the beauty and grain of the hardwoods most notable in daylight, and at night-time, the color of the light diffused as a result of the shape and placement of the piece. This month, we're sharing Bob Clement's safety tip on making sure you always use sharp blades on your tools. Blog: How Clean is Your Workshop? This month we are featuring Oliver Apitius' workshop in Shelburne, Ontario, Canada. This month, Steve discusses dust as a shop lubricant, the benefits of using microfiber cloths, people watching in furniture stores, and why multi-tasking can sometimes lead to epic stupidity! This month Alan shares his steps for removing mold from both the finished and unfinished areas of your furniture. Poll: How Clean is Your Shop? In our first polling blog entry, Jim Randolph asks "How Clean is Your Workshop?" He also shares his experience on keeping his shop clean and organized. 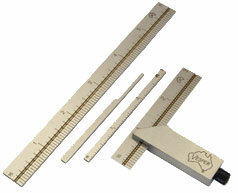 Most of us would agree that an adjustable fence gauge is an essential layout tool for fine woodworking. Typically gauges are divided into two categories: cutting and marking. Most folks wind up with one of each type or purchase a metal, wheeled gauge. The gauge discussed in this article employs a unique cutter that works similarly to a wheeled cutter, but in a traditional wooden frame. We sent 5 of our Highland Woodworking employees to Woodworking in America 2015 this past September in Kansas City, MO. We reconnected with a lot of our vendors in the Marketplace and participated in several classes with woodworking greats like Roy Underhill and Jeff Miller. We documented a lot of our experience in blog entries and photos and have combined them for your viewing pleasure. Click below to watch a product tour of the Tormek T-4 Sharpening System with Steve Johnson and find out how this system can easily sharpen almost every tool in your collection. Order any of the above 4 books from us during September/October for 33% off list price. Woodworking happenings throughout the country. CLICK HERE to submit your community woodworking event for possible inclusion in our next newsletter. Come meet one of TV's biggest crowd pleasers, Woodwright's Shop host Roy Underhill, our special guest during our Highland Woodworking Open House in Atlanta on Saturday, October 17, 2015. Roy will be giving FREE hand tool woodworking demos all day long. Also on Sunday, October 18, he will teach a 1-day class, The Dovetail Variations . This month we're featuring the Festool ETS EC Brushless Sanders with a Festool video demonstrating the benefits of these new sanders, including less fatigue, increased flexibility, better surface results, and more! We've now sold more than a thousand of this little gem. We highly recommend it as your first bandsaw bought on a budget, or as a second bandsaw that allows you to avoid constantly having to swap blades on your main bandsaw. Right now it's extremely affordable while limited supplies last. Now you can purchase the DVD that documents the complete contents of H.O. Studley's famous cabinet, as written about in Virtuoso -The Tool Cabinet and Workbench of Henry O. Studley . In addition to documenting the cabinet's contents, the DVD also contains an interview with author, Don Williams. Bessey K Body REVO Clamps SUPER SALE!! Bessey K-Body REVO clamps are the best choice when gluing-up doors, panels and cabinet carcasses. We are offering Bessey's K Body REVO Clamps at special prices while supplies last. These special prices are only available in the clamps sizes listed on the product page and for clamps sold in pairs of the same size. Get yours before we run out! New from Lost Art Press, By Hound & Eye is an illustrated companion workbook to the authors' By Hand & Eye . Take the cartoon journey through the world of pre-industrial design geometry. It stars Journeyman and his pizza-loving dog, Snidely, as they untangle the world of points, segments, arcs and the three-dimensional world using nothing more than a compass, straightedge and pencil. For a limited time we are offering a sweet deal on our bestselling plan bundles for building Charles Brock's Sculptured Rocker and Sculptured Dining Chair. Purchase either plan bundle and receive for free an extra companion set of plans, each valued at $30. The bonus plan for the Rocker enables the chair to be built from 8/4 lumber instead of 10/4. The bonus plan for the Low Back Dining Chair enables you to instead build it as a High Back Dining Chair. Here is an economical way to outfit your workshop with a useful workbench that comes complete with 4 drawers and a sliding-door cabinet for convenient storage of your hand tools. While limited supplies last during September and October 2015, this specially-priced offer also comes with an accessory kit that includes a bench holdfast, a pair of jaw cushions for gripping delicate work, a pair of aluminum jaw protectors, plus a steel anvil for metalworking. Do I have a bone to pick with you! Your Wood Slicer 1/2 inch Resaw Bandsaw Blade that I just purchased works exactly as advertised. I followed your instructions and either I got lucky or they were correct but I couldn't help but smile as I resawed through lengths of some gnarly 6" red oak that gave the previous blade fits. I'm not sure it even needs a cursory pass through the planer as the cut is so clean.